In September an old friend commissioned a piece that could be used to present his partner with an engagement ring. That was the only criteria we were given, below are some of the creations we came up with. This past autumn I was commissioned to build a chair by a student in the Chair Design class I was co-teaching with Jeff Miller at the Center for Furniture Craftsmanship. During the brainstorming / model making / getting creative energy flowing exercise the student (Jed) came up with a captivating model by "simply" folding paper together into the form of a chair. I wish I had decent pictures of the model, but let me tell you, Jeff and I were both immediately drawn to this concept and the potential it had. After a day or two of head scratching our collective brain power was getting pretty mushy, Jed's chair was redesigned capturing some of the elegant lines the model had into a design Jeff, Jed and I were confident in Jed being able to build in just over a weeks time. By the end of the class Jed had created a striking, sit able chair, but he longed to see that original folded together model come to life. Jed commissioned me to make the original design, the endeavour took on a new life. I knew I had gotten myself into a pretty hefty challenge, but let me tell you, I greatly underestimated what lay ahead. 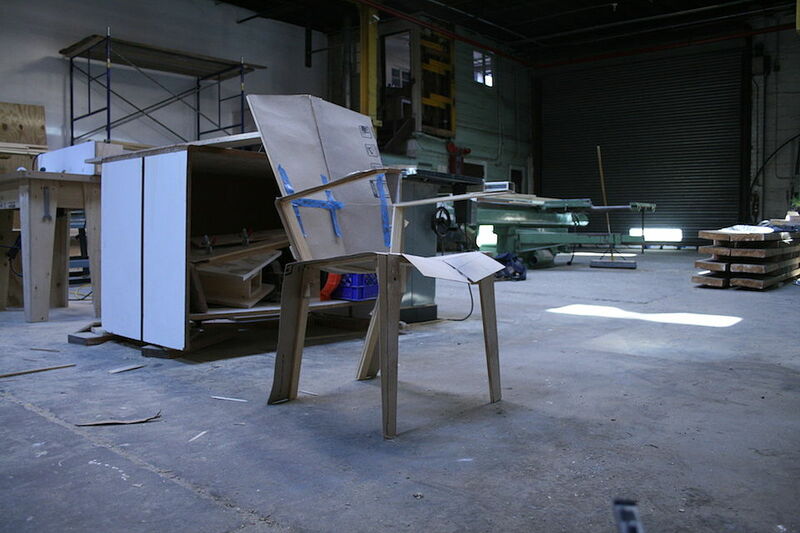 Fold some veneer here, fold some veneer there, voila, chair. I knew it was going to be labour intensive, but what I did not anticipate was the mathematician level of trigonometry / master origami problem that lay before me. I started in my sketchbook (like always) and came up with a few reiterations of the chair I was content with and started trying to decipher just how to build one of them. After more head scratching I realized I was chasing the wrong concept altogether, and that in reality I wasn't pleased with any of the three concepts I was initially working on. I was trying to merge Jed's original model, his finished redesigned chair and something I thought would be comfortable into a pretty little package. I had ended up in a place with a chair that lacked a cohesive look and feel, I reached out to Jed wanting to discuss the project with him. Jed had no interest in seeing and adding input on the designs, he wanted me to find the right design for myself, to look past the hangups and let my voice be heard. It was a deflating and empowering moment all at once. I took a long walk, enjoyed some fresh air, and realized I needed to go back to the start. I got out the paper, and for what seemed like days folded together both model sized and full sized chairs. From here my current concept was born. I ended up straying a bit from the original model Jed had folded together back in September, but have found a direction I believe will lead to a very unified, refined looking piece. The plan is to make the chair out of just two parts, seems easy enough right? The first part will be a bent panel that makes up the back rest, arm rests, and back legs of the chair. The second part will be a bent panel that makes up the front legs, seat, and another set of back legs. The two panels will then be joined (glued and bolted) up the back leg. Both panels will be pressed out of commercial veneer with alternating grain direction to essential be shop made plywood, this way it will be strong and stable. There will be relief cuts in the veneer to allow for the panels to split apart (top of the back rest and front of the seat) where the panels change the plane they are being bent on. 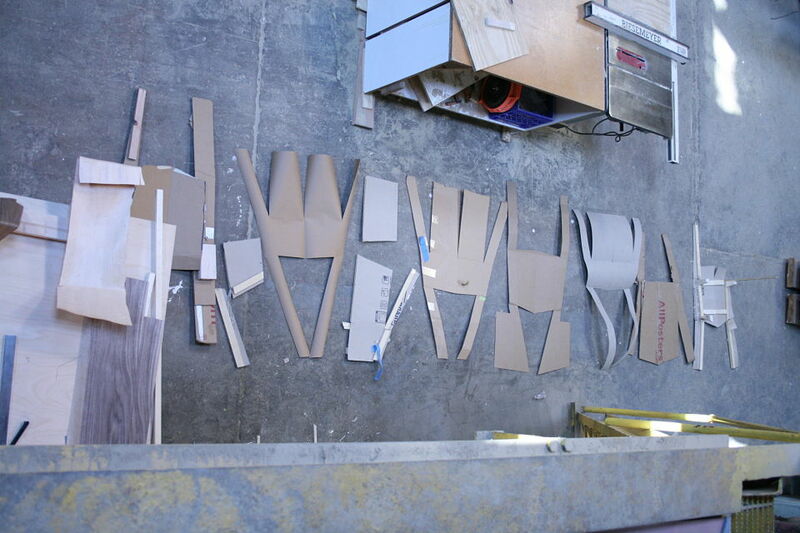 Pictured below are a few (of what seems like hundreds at this point) of my mockups. They are cut from paper, cardboard, and one version made out of plywood to get something rigid enough to take angles from and sit in to work through ergonomics. I know it doesn't seem like much yet, but stay tuned, this will be a learning intensive journey for everyone involved. The slats have all been fit on Dining Table No. 1. After having steamed and twisted the 66 white oak slats they had a lot of water stains on the slats. The water stains were on the slats when they came out of the steam box, I can't say for sure why but my hunch is I didn't have them spaced out enough and/or condensation was dripping down onto the slats throughout the steaming process. In most cases I wouldn't worry to much about it, just scrape and sand until clear. However the design called for the outside face of the slats to have a bandsawn texture, this meant I was going to have to find another way of removing the water stains. Some internet searching led me to find an organic compound solution, oxalic acid, which is a poison found in rhubarb. I ended up in what I can only best describe as a mad laboratory studio in the east end of Toronto where I purchased a 100g of the powder. Mixed roughly 10 parts water to 1 part Oxalic Acid I began scrubbing away at the stains with a wire brush. The test proved semi successful, although the stains were mostly gone the colour in the wood went with it leaving a sort of washed out dirty bleached look. It was undesirable for the finish I was looking to attain and meant going back to the drawing board. With no real explanation as to why I thought it would work I decided to try and steam the stains out (last resort). Armed with my second hand iron and a wet clean rag I began steaming the water stained spots. Much to my disbelief the stains were lifting right out of the wood and actually transferring onto the rag. Some of the darkest spots took a couple tries but in the end I was left with clean (and wrinkle free) slats. I prepped them for finish by using the wire brush in line with the bandsaw marks to clean the slats and sanded a small chamfer on the edges. Few coats of wipe-on-poly later and I couldn't be happier. As much as I had fun with my brief organic compound trial, I am thrilled that steam was the solution. Be it bending, twisting, fixing dents or removing water stains, steam is the trick. A little while back we were twisting the 3/4" thick by 2" wide by 34" long white oak slats to make up Dining Table No 1. We were doing this with kiln dried wood, which typically speaking doesn't steam bend all that well, but given that the most extreme twists for the table are around 45 degrees we tested it out, and it seemed to work without any problems. After one long day and some 70 slats twisted and clamped to the metal base to dry we decided to "test the limits" with the few that remained in the steam box. The slats were steamed for roughly 2-3 hours at 200+ degrees fahrenheit, the results were pretty incredible, to watch the bending happen check out this video. Well at the Center for Furniture Craftsmanship (CFC) co-teaching a chair making class I started designing a bar stool in the evenings. When my brain started getting mushy and I couldn't make sense of my full scale drawing I decided to embark on something a little "easier." Dodecahedrons....kind of gives a bit of insight into this stool I'm designing. Made with the intention of being hanging pendant lights in my apartment I feel they are somewhat multi purpose, perhaps planters? There is cross grain construction going on I know, they just might blow apart over time. They are Pine (which I believe is pretty stable) and are pretty small (under 5" tall/wide) so they might just be okay. Time will tell. I would like to try and make them without joining them and leaving gaps around all the tiles for the light to escape through, something to try in the future, I did already allude to the mushiness of my brain that day and that kind of engineering seemed like a lot to embark on. Suggestions welcome!